Companies could boost their productivity by between 1 and 3.5 per cent, adding as much as £70 billion to the UK economy, by focusing on how the workplace might be used to generate revenue, instead of regarding them simply as a cost to be managed. That is according to the newly published The Workplace Advantage report from The Stoddart Review based on a meta-analysis of 200 studies by workplace expert Dr Nigel Oseland. Taking a new approach to how space is used to help employees to be productive and changing who is responsible for the decisions is the first step. 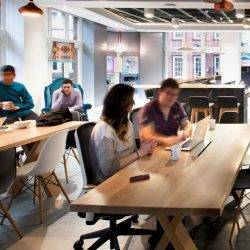 The Review, a collaboration between business leaders and workplace experts, found that only a little over a half (53 percent) of the UK’s office workers can say their workplace enables them to be productive. For the rest, a workplace that’s unproductive is also affecting their pride in the company, its image and culture. It found that too many businesses are prioritising filling up their offices with people rather than asking themselves ‘what will make their staff productive’. As a result, as many as 70 percent say their office is too noisy and they are disappointed by the lack of different types of workspace including communal areas and break-out zones. The Review was conducted through qualitative interviews with business leaders, property industry experts and academics, and is anchored in data from more than 200,000 employees in 63 countries. Polly Plunket-Checkemian, programme director of The Stoddart Review says: “We need British businesses to take note. It is staggering that only half of employees can say their place of work enables them to be productive. The office is still incredibly relevant to us all, not least because nine out of ten people in the corporate environment still work in an office or predominantly in one place. And given the importance of knowledge workers to our economy, attracting them, retaining them and helping them to be productive is critical to UK PLC. Pushing cost savings through occupier density is the enemy of productivity. One of the biggest errors businesses make is thinking in terms of cost per square foot rather than revenue per square foot. They don’t recognise the importance of creating a variety of spaces to meet different needs or social infrastructure. It’s the difference between fitting people into a space, rather than creating places to fit the people”. Baby boomers better off at work but their wellbeing must be managed Can an organisation simply buy employee motivation?